Along with magnetic piston for position sensing, NEN Series features adjustable cushions, low-friction nitrile seals, and Teflon wear band on piston. Viton seals are available, and cylinders come standard with sleeve-nut construction with NFPA MS4 bottom-tapped mounting. For mounting flexibility, add-a-mount option permits changes, additions, and reorientation of NFPA MF1/MF2/MP1/MP2 mounts at point of use. LITTLETON, CO., June 8th, 2007 - Norgren, the pneumatic motion and fluid control specialist, recently launched the NEN line of NFPA Cylinders. Standard features of the NEN NFPA Cylinder include: Magnetic piston for position sensing, Adjustable cushions, Low friction nitrile seals, Teflon wear band on the piston, Sleeve-nut construction with NFPA MS4 bottom-tapped mounting and Viton seals available. The Norgren NEN Series Cylinder also offers the "Add-a-mount' flexibility which offers the addition of the four most popular NFPA mounts (shown below). The 'add-a-mount' design makes cylinders more convenient and brings a new dimension to NFPA air cylinders by permitting mounting changes, additions and reorientation at the point of use. The Norgren NEN Series offers competitive pricing and same day shipment for stock stroke cylinders. 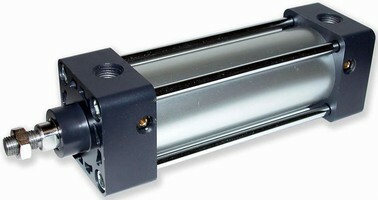 With the NEN series NPFA Cylinders, Norgren is offering the best total value cylinders in the market. Norgren is one of the world leaders in the supply of pneumatic motion and fluid control technologies for a wide variety of different industry sectors. Norgren is committed to optimizing technological performance for its customers' advantage. All of Norgren's systems are engineered for flexibility based on strong product fundamentals. Application specific solutions frequently involve integrated or modular combinations of actuator, control valve and air preparation technologies. With established manufacturing facilities in the US, Germany, UK, Switzerland and Spain and newer facilities in Mexico and the Czech Republic, Norgren has the global manufacturing and support capabilities to be able to cope with the most demanding international projects. With support through an established sales and service network in 75 countries Norgren has the global reach and capability to ensure continuity of supply and local support where it is needed for customers involved in export markets or multi-site operations. With three global technical centers in the US, Germany and the UK supported by 270 engineers, Norgren is a subsidiary of the $2.9bn IMI PLC. In the US, Norgren has a unique network of almost 100 distribution outlets operated by independent distributors.